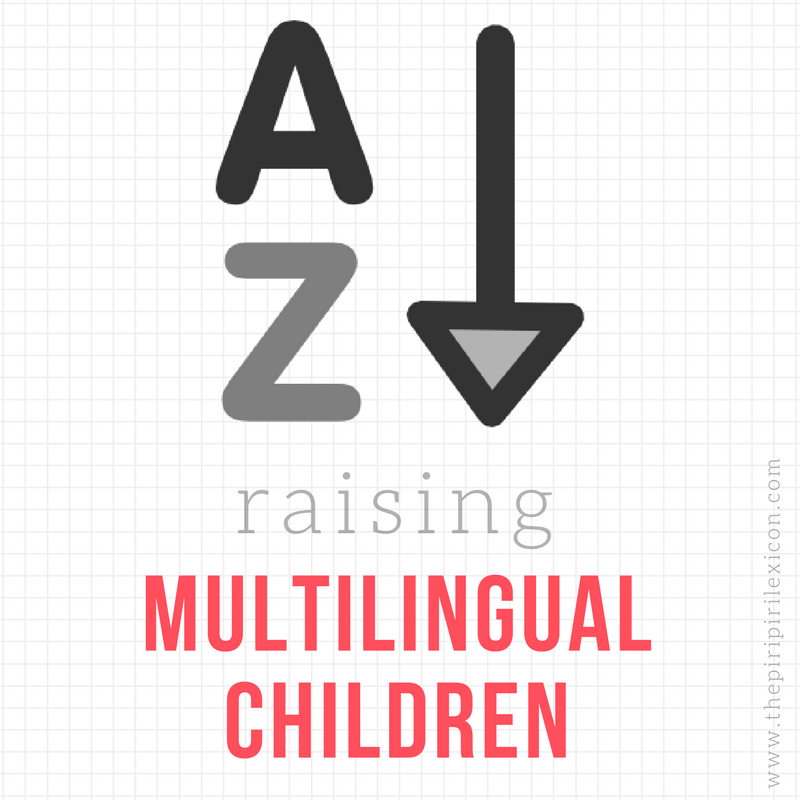 Raising multilingual children? About to embark on your journey? Have young children but you would like to review your situation? 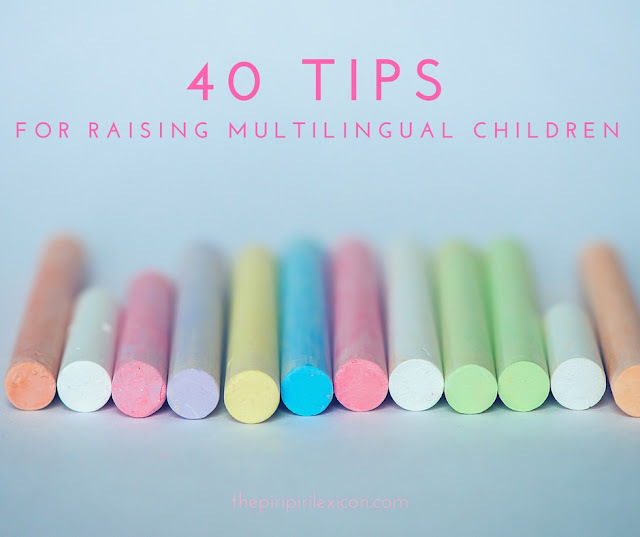 Here are my best tips for raising multilingual children: from my former-lingusitics-resarcher self and my current-mother-of-two-children-exposed-to-4-languages self. There is something for everyone. I am not keen on tips that are all about making plans, sacrifices and that overall sound like really hard work. I like simple, go with the flow, no-nonsense approach (no making videos of yourself (who has time for that?) or using reward charts here). This is my #1 tip because it it the most important, my favourite and true in any situation, for anything. Too many people worry about the best way to do it, what to do in X and Y situation, how to respond, etc. So, please, do not stress. It is not worth it. It is not a matter of life and death. I am a mum, I know what it is like to worry about your children. But we've been there, breathe, everything will be ok. Read more here. I am a great believer in following your gut feeling. Like for everything else in parenting, we all do the best we can. We all do things differently, but most of our children turn out to be decent human beings. I like to think that it is a good idea to read about what is normal and what is not for bilingual children. Whether you turn to blogs, online forums or books, it is always helpful to realise that some of the things your child does is totally normal in bilingual kids. Personally, I also like to go beyond the headlines. You will see a lot of people write on their blogs claims that are totally unsubstantiated. Do your homework. The scientist in me is appalled by such claims that have no scientific basis, yet most parents read and think it must be right because it is right there on the internet. Along the same lines, you might ask for advice, help from other parents of bilingual children, online or in person. HOWEVER, be cautious, because someone tells you that doing X worked wonders for them, it might not work for you. Almost every single bilingual family is different. The amount of time children are exposed to each language varies, for example. So take their words with a pinch of salt. You will find in the literature and in the words of other parents, that a lot of people swear by using a one-person-one-language strategy. This is because it is the most well-documented startegy because it is easier to study and monitor. However, it doesn't mean it is the best strategy for your family. As I mentioned before, every family is different and every strategy is good. Some like to switch language every week, others use a different language whether they are at home or outside of home, some mix between languages. There is no wrong and right. Go with your gut and do what feels right for you and your family. You can read the stories of many different kind of bilingual families here. Your child is starting school or you are moving country or you are getting an au-pair, so your language exposure times will change drastically. In that kind of cases, nothing says you can't change strategy. You can switch the language you speak to your children. Make sure they understand why you are doing it and they are mostly on-board with it. Use a gradual approach if necessary. Make sure you are both on-board with whatever it is you have decided to do because someone who is not fully convinced will drop the ball at some point (trust me, I have been there). If you need arguments, there are plenty here. Family support is vital when raising multilingual children. Explain why you are choosing to raise your child with more than one language, why it matters to you and why and how you need your family's support. Set out the roles early on. Grandparents always want what's bets for their grand-children, and will most likely be happy to help. Read more tips for grandparents here. Is your child 6? Are you sad you didn't teach them your language? It is NEVER too late. They might struggle to adjust. They might fight it. But it is never too late. Try. Try introducing a little language here and there through cartoons, music, stories, anything that interest them. Even the little bit they will hear will not be lost. My friend Frances' situation is the best example of this. Don't ever think that what you are doing is not enough. If it is the best you can do, then it will have to do. We are not all super-humans and we cannot all make videos of ourselves reading books to our kids for when we are away or when they need more exposure to a minority language. Don't ever feel bad. We are sowing seeds in our children's brains and those little language seeds will hopefully one day turn into beautiful plants, whether they are little ones or big ones. You may start by thinking that by just speaking your own language, you will pass on your language to your child. This may work out that easily. But it may not. And there may come a point where you will have to make sure your set out your aims for each language. Do you want your child to be fluent in each language? Do you want them to be able to read and write in every language? Do you want them to just be able to understand their grandparents? Ask yourselves all of these questions regularly. When setting your aims, please be realistic. Asking your child to pass for a native monolingual speaker in Y language when nobody around them speaks it but you and there is no contact whatsoever with any other native speaker will be tough and may be too much to ask. Once you have adopted a strategy, stick to it. Children like some kind of regular pattern they can easily remember. Whether they associate a place or a person or an event with a language, it doesn't matter. But make a decision and stick to it. If after months and months of something not feeling right for you or your child, or if something is too difficult, review it. Ask yourself why it is not working and re-evaluate its purpose, usefulness. As I mentioned previously, there is no scientific basis for claiming that changing strategy will harm your children. Bilingualism is very rarely the root of any serious language delay or impairment. Everyone can become bilingual. There is plenty of scientific evidence out there to support it. Seek out specialised help at all cost and avoid anyone putting the blame on bilingualism. Read more here. When it comes to choosing daycare, schools, etc, remember that language in itself is not a curriculum. Because a school offers teaching in a minority language, it doesn't mean it will suit you or it is of decent quality. Do your homework. Read more of my thought on this here. Someone told me the other day that 3 or 4 languages were really too many for my children. That person was a language teacher! I was flabbergasted. There is no scientific evidence for this. On the contrary, research shows that when you already know two languages, learning the others is easier. Read more on this here. Plenty of people raise very successful bilingual children without spending a penny more than what a monolingual family would. Many people in different parts of the world becoming fully-functioning bilinguals in the most natural way possible. Saying that you have to spend money or make sacrifices is a little strong in my opinion. It is all about what matters to you and your priorities. Read more about this here. Again, ill-informed people will tell you that you have to speak the community language at home before your child goes to daycare to give them a head-start. This is not true. If you do that, you will leave open the door to the community language and your child will most likely then never revert back to using the minority language you once were speaking to them. Read our story here. Don't forget to talk. It seems really obvious but many parents forget to talk to their children when real life sets in. Here are some of my favourite tips. Whether it is bilingual books, books in a minority language, magazines, catalogues, anything goes. More exposure to words and language is a win. Language is not everything. If you are struggling to get your kids to speak a language, get them to love the culture. Use their interests to boost their knowledge of the country(ies) associated with it. It will hopefully light up a spark in them and is a fun way to learn. Above all, you need to create a need for them to speak the language. So whether that need is to be able to read their favourite comics in their minority language or to speak to grandma or to visit an animal shelter, make sure the need is real and not just made up for your benefit. They can tell. Read more about this here. In our house, we have currently discovered a Portuguese children's radio streaming for free on the internet. This is a great solution to our lack of exposure to our weakest language. It won't make my kids speak Portuguese but it sure will make them listen to plenty of it. Code-switching, using more than one language in a sentence/conversation, will not harm your child. You are multilingual yourself, you need to show them what being multilingual is all about. Many cultures do this as standard and it is not a sign of weakness or lack of knowledge. Read more here. Probably the most spread myth currently in forums on multilingual parenting. It has no scientific basis and, even if it might be a useful benchmark, is mathematically impossible for many. Read more here. Of course, nothing beats finding other children the same age and who speak the same language(s) to play with yours. This is difficult and even near-impossible in some cases, I realise that, but always look. You never know. Getting uncles and aunts to give your children, books, DVDs, music, etc in a minority language is invaluable to a multilingual family. Always make it clear to friends an family. And remind them! Often! Barbie is great but throw in a small book, please! If you are a multilingual parent, don't pretend you don't understand when your child uses another language than the one he is supposed to be using. They are not dumb. They know (from very early on). Explain why it matters to you or use the little game described below. Set the right example: to be multilingual. My husband and I used to have a secret language. We speak English between us and with expat friends. Our kids are picking it up totally passively and indirectly. And it works. We don't put any emphasis on it as English is prominent worldwide and they will always be able to learn it at school. Yet, our 6 year-old can have a decent conversation with friends. Read more here. In our family, our favourite game is this one. This is fantastic for toddlers. It shows them you are multilingual too and it reinforces their language awareness from a young age. I know this is not always possible, but a short visit to relatives in a foreign country or even just opening your children's eyes to other languages and explaining to them how lucky they are to be speaking already 2 or 3 languages, is great at any age. Nothing beats a visit from Grandma to boost your child's language skills. Read our experience here. We found that our toddlers loved when we pretended our puppets only spoke one language and they had to play with it in that language. Many programs on Netflix are available in original languages and there are many ways to get cartoons and films in different languages these days (all legally, of course ;-)). Also apps often have a language selection option. Here are two of our favourite for toddlers. Show them how important and useful it is to speak more than one language. I just chatted to my girl about to start school about how cool it is going to be to be able to speak to and make friends with all the kids from the different language sections in her new school. Whatever you do, it will be better than nothing. Whatever you do, it will be up there in their brain, ready to be developed later if they so choose. Fluctuation over time is normal. You never know what is around the corner and what life can throw at you. Don't give up. Don't force languages like they are subjects to be taught and learnt. Live your life surrounded by multilingual people, seek out multilingual experiences, make multilingualism normal. Children will soon understand its importance and benefits. As our new school director said last week, the most important is to try and communicate and use your languages. Mistakes are not important. All you can do is give it your best shot and encourage your child to do the same. After all, the main purpose of language is communication, right? Phew, hope you made it to the end. Hope you liked my little collection. Got any tip to add? 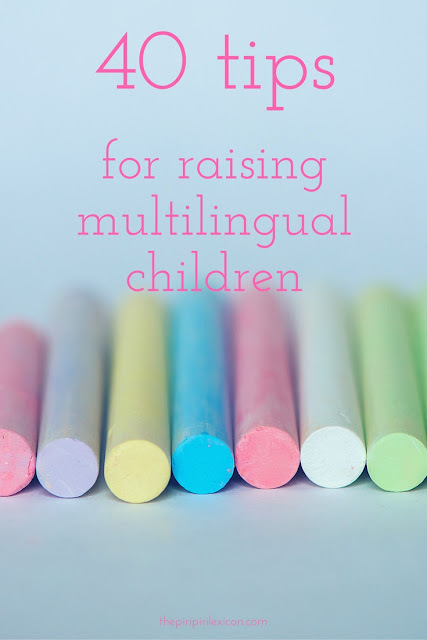 You can find more about raising multilingual children here. MarocMama: 40 Things to Do in Morocco You Haven't Thought Of! Excellent and thorough list Annabelle, I think the most important one is N° 1, don't stress (I know probably easier said than done in some cases but so important). Fab list! For me, number 12 is the most important. Without a clear reason and direction, the rest is sure to collapse. But with number 12 in established, these are 39 more great ways to support the goal. Sharing! It is great to hear from someone who is so experienced and knowledgeable such encouragement - and not to stress about it! I love also the idea of building pride in themselves as multilingual speakers. I think the tip I needed to hear the most is #26 since I code-switch a lot! I always get told off for not being consistent and that my child would get confused - so this was a reassuring and fresh angle for me. Thank you for compiling this excellent list, I have a feeling I will be returning to it many, many times. Thank you for taking the time to write this. I am glad it helped. Don't beat yourself up. We are all doing the best we can. This is a practical list of tips that all bilingual/multilingual families can reference on every day. Have fun and keep talking in your target languages! Best summarized information I found on the internet sofar. Thanks!